More than 800 jobs are to be created at Peterborough’s Queensgate shopping centre as retailers prepare for the Christmas shopping spree. Department stores John Lewis, BHS and Marks and Spencer will collectively take on an estimated 100-plus positions. Boots, Argos, HMV and River Island will each recruit between 20 and 30 extra roles. The popularity in jewellery means stores such as Pandora will take on 20 additional staff, and the rise in computers and home entertainment sales sees Game recruiting for 15 positions. The Christmas period is one of the busiest times for stores such as Card Factory and Lush which confirmed 18 and 11 additional staff respectively. The 800 positions are a huge boost to local employment and representative of the economic benefits Christmas brings to Peterborough city centre. Clothing giants Primark, Topman, Topshop, Fat Face, Superdry and Jack & Jones have all confirmed that they will join the recruitment drive this month. The extra demand on restaurants will also push employment up with Carluccio’s recruiting six serving staff and Handmade Burger Co an additional four. Centre director Mark Broadhead said: “Queensgate is one of the biggest employers in Peterborough with more than 2,500 local people employed throughout its 100 retailers, operational staff and management. More than 85 per cent off its retailers will be taking on new staff and the advice for part time job seekers is to contact each store directly. Councillor John Holdich, leader of Peterborough City Council, said: “It’s great to learn that Queensgate retailers are looking to recruit this number of temporary seasonal positions. 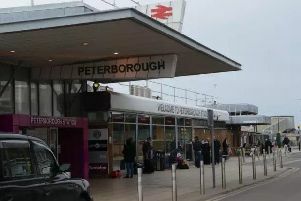 “These roles will be ideal for a number of people, not least the large of number of students who live in Peterborough, or those returning to the city from elsewhere. With less than three months to go until the big day, John Lewis Peterborough has unveiled its atrium decorations ahead of the festive period. Brightening the atrium of the shop, the 2015 scheme is entitled ‘A different perspective’ and seeks to play with scale and proportion to create interest. Triangular red and green Christmas trees are suspended amidst large mirrored ‘snowballs’, creating a colourful and playful look. The scheme was installed by two workers suspended on abseiling lines, and took six hours to complete. The Christmas jobs announcement is more good employment news for Peterborough. Last week, new figures revealed that the number of people claiming Jobseeker’s Allowance in Peterborough had fallen to 2, 015 in September from 2,090 the previous month.